Under the Professional Standards Framework (PSF), the Areas of Activity, Otherwise known as the “As”, constitute the educational activities undertaken by university teachers and supporters of learning. You will use them to structure your application. There are five Areas of Activity: Associate Fellows of the HEA (AFHEA) need to write to at least two of these Areas of Activity in their reflective narrative, while Fellows (FHEA), Senior Fellows (SFHEA) and Principal Fellows (PFHEA) need to write to all five. It is rare that you can take the ideal teaching design for your teaching “off the rack”. Your students differ in many ways (undergraduate/postgraduate, year level, background knowledge, gender, culture and linguistic diversity, employment focus, etc). Perhaps your learners are actually your peers: staff or students. 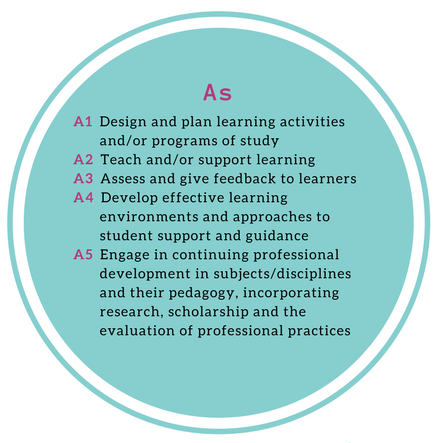 A1 is about the way in which you plan, develop and prepare learning activities, courses and curricula, whether face to face or in a virtual learning environment. Educators have different approaches to learning design, based on factors such as the level at which you are teaching, the nature of your learning audience, the learning outcomes for a course or individual teaching activity. Don’t forget that your “learners” may be undergraduate, postgraduate, research students or even academics. You may have a great deal of autonomy in the design process (e.g. as a course convenor) or you may have minimal opportunity (e.g. as a tutor). Your reflection could include discussion of the way you have designed or overhauled curriculum or individual learning activities for your learners. You could include examples of learning activities you have designed for a wider group, or even supplementary activities you have designed for individual learners who require additional support. Think about why you designed these things the way you did, what the impact was on your learners, and any lessons you learned along the way. Describe and reflect on the What? How? Why? And So What? For many university educators, teaching and supporting learners is a key activity. The nature of that teaching may be very different: some teach in labs or hospitals, many teach in large or small classrooms, and some teach on the beach. Some teach hundreds while some teach one at a time. A2 is about your direct engagement and interaction with learners, whether in groups or individually, remotely or face to face. This may consist of formal, timetabled approaches or teaching contexts outside scheduled classes and more informal in nature, but nevertheless essential to student learning and taking place in a wide range of contexts. Your “teaching” activities might include a variety of things (see examples in the table below). You need to describe and reflect on your current and ongoing use of discipline-appropriate and effective approaches and methods of teaching and supporting learning, as well as show how you are developing your skills and Core Knowledge (K1–K6, with K1 and K2 for AFHEA) and how that has helped you choose the most appropriate approach for the achievement of the learning/curriculum aims. This is where you talk about the nuts and bolts of what you actually do as an educator. What teaching strategies do you implement? What is your teaching style? How do you structure your classes, workshops or labs? How do you support learners who need additional support and guidance? What is your teaching activity? How is the teaching carried out? Again, describe and reflect on the What? How? Why? And So What? How do you access the work of your learners? Learning is more effective and faster when a knowledgeable person (a “teacher”) gives expert, timely feedback (“formative assessment”). In universities, assessment is also part of the certification that society requires of professionals, innovators, thinkers and leaders. A3 gives you the opportunity to reflect on why, how and when you assess and how you give useful feedback. What kind of assessment methods do you use, and why? What is the literature that undermines these methods? How do you provide feedback to learners? What kind of feedback strategies do you use, and have these strategies evolved over time? How do you adapt your assessment and feedback to fit in with different learning styles and class structures? For example, providing feedback in a lab will likely have different requirements to providing feedback in a traditional classroom. the appropriateness of the assessment approaches and feedback techniques that you use in a specific context. What was the context of your feedback? How did you give feedback? University teaching may be face to face or online, and may occur in a physical or virtual space. In every case, the learning environment is what the educator makes it. Do you do anything in particular to create an inclusive, safe and productive environment within your classroom? Do you set up the room/lecture theatre/lab in a specific way? This can also translate to online learning, and the type of learning environments you create via your wattle page, or use of social media. You need to describe, and reflect on, your rationale and experiences in developing and using learning environments. The emphasis should be on your understanding of the importance of the learning environment/s, acknowledging the different styles of learning that take place in them. You are asked to reflect on how you create effective learning environments, and how you put in place, use and fine tune strong support mechanisms, academic, practical, pastoral, personal – to enhance learning. What strategies do you implement to help students who need additional support? Your examples can be for individual students, or groups of students. You might describe physical or virtual learning spaces, and visual, written and practice-based learning. Learning support activities might refer to learning through tutoring, one-to-one advice, counselling, developing practice to meet the learning implications of widening access, or supporting learners with disabilities etc. You might particularly want to refer to the Professional Values (Vs) in connection with this Area of Activity. What is the learning space? What did you consider in the design of the learning environment? Have you changed how students use the space? What services do you support? What do you do to improve yourself as a teacher? Trial and error can only get you so far as an educator! Engaging with professional development and adopting evidence-based approaches can be much more effective. A5 asks you to think about the kind of formal and informal professional development and educational research that has influenced your practice as an educator. Have you attended workshops at CHELT? Workshops within your College or at other institutions? You need to be able to talk about what you learned from your Professional Development activities, and how you then applied these learnings to your teaching. Scholarship of teaching and learning is evidenced differently for each level of application but even an AFHEA application should include a focus on pedagogy and your subject knowledge. Think about how you find out about teaching and engage with your peers operating at a variety of levels – this might be informal dialogue, conversations and classroom experiments; action research; conferences and seminars; exchanges; or the scholarly literature. All of these activities potentially provide evidence of good scholarly practice through critique and reflection. Making use of published educational research to inform your practice. Kreber, C. (2005). Charting a critical course on the scholarship of university teaching movement. Studies in Higher Education Vol. 30, No. 4, August 2005, pp. 389–405. Kreber, C. (2013). Authenticity in and through teaching in higher education: The transformative potential of the scholarship of teaching. Routledge.